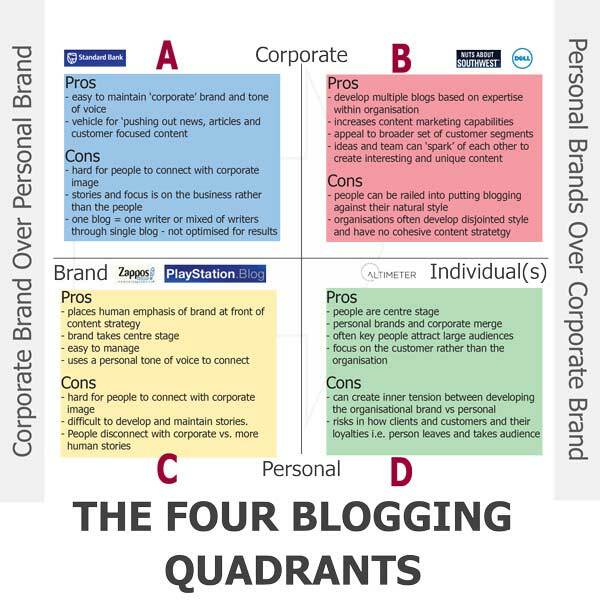 This is a simple framework to diagnose blogs and the strategic options in improving customer engagement, website traffic, brand awareness and ultimately customers. 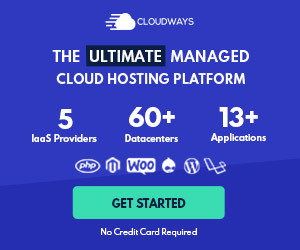 You have probably come across these blogs – they echo the days of broadcasting and closed customer relastionships – no personal / human quality. These corporate blogs produce content that is internally focused and/or related to press releases. 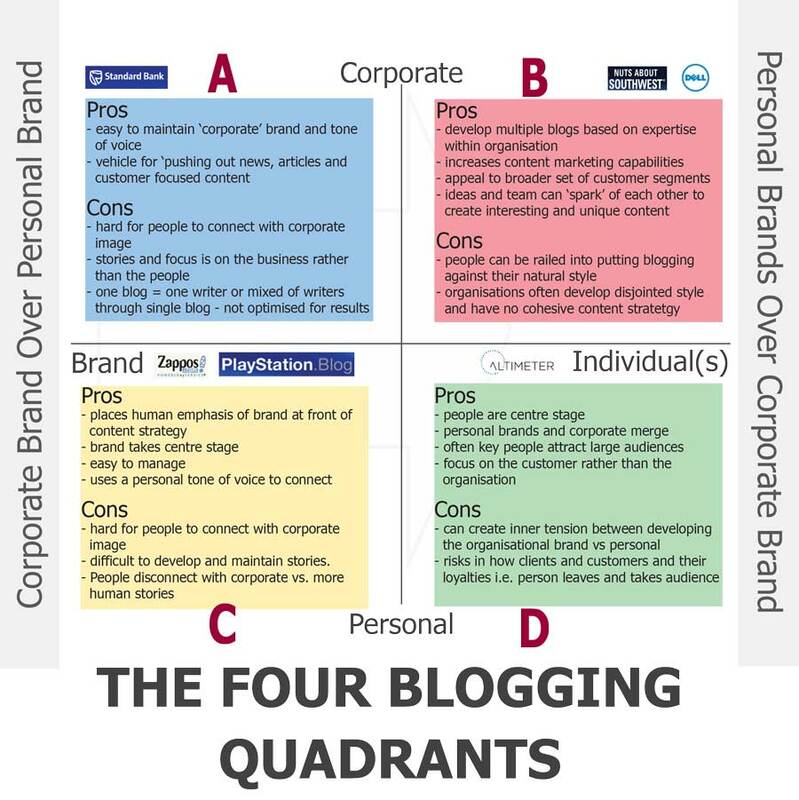 There is no person visible as leading the blog and no human traits are displayed in the content e.g. humour. Another typical sign is that content is not posted very often. RESULT – low content sharing; low customer engagement, low social media presence. Corporates like CISCO, DELL, HP, Forrester…have used the expertise of their people to produce market relevant content. These blogs, often related to different subjects or customer/market segments. Each person has a profile usually related to their area of expertise. Whilst it is personal the editorial and content is corporately driven and demonstrates a high level of editorial control. Blogs are customer focused and carefully moderated. RESULT – Very relevant content targeted to each market. Customers can connect and interact with expert building trust and a relationship. High levels of content. The brand personality blog demonstrates a single blogger using a more human and personal writing style in oline with the brand personality. The blogger is usually presented as a person, genuine or not, and they write in a consistent manner (based on a brand persona). They are allowed to be funny, responsive and produce content that is focused on adding value to customers i.e. they listen to customers and produce content that helps solves problems and adds value. RESULT – People are able to relate and connect with the brand. Content is focused on engagement, relevance and adding value to customers. Social sharing will be greater and so will the ongoing brand communities/following. If you look at the likes of Chris Brogan, Scott Monty and Brian Solis these social media rockstars all work for organisations/businesses. They are natural bloggers, ambitious and motivated to develop their own personal (me) brand. 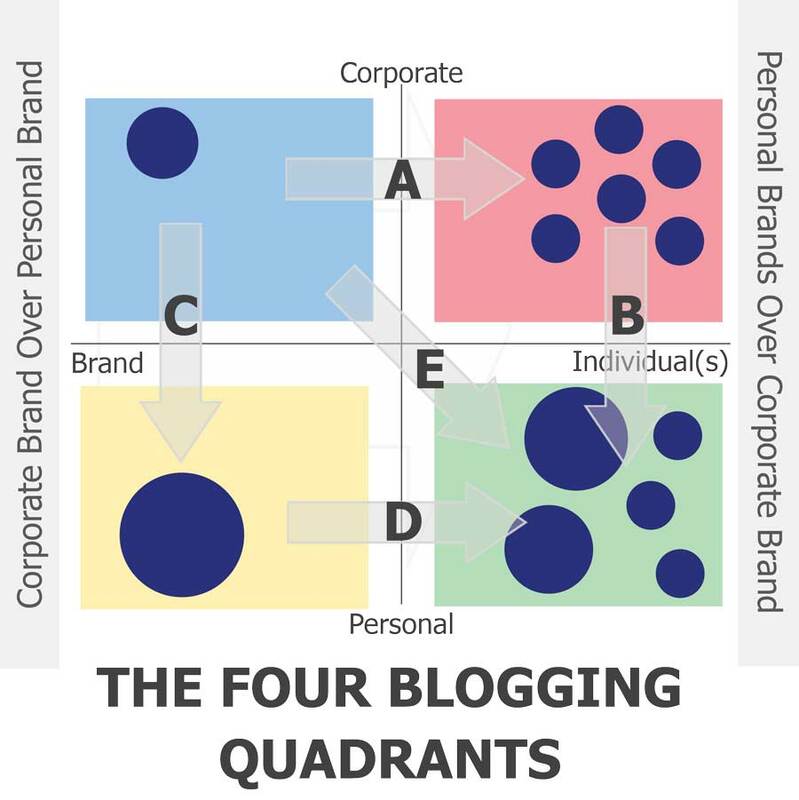 As (brands) bloggers they will want the freedom to develop their own ideas and foster their own following. A corporate can harness this to bring on board an audience, develop these people as thought leaders and encourage these personal brands to actively participate in leading internally and enhancing the corporate image and capabilities. RESULT – corporate gains a great deal of expertise, a large following and thought leadership. However, there is often an innate tension between the personal brand and the corporate identity. Done well they can both benefit. Corporates then have strategic choices as they develop and learn. Much depends on the overall social media strategy and cultural alignment – open vs closed. Corporates identify core customer segments, produce an internal team focused and develop relevant content to these audiences. Each person has their own company identity, focus and becomes a touchpoint for the organisation. The benefits of this are the increase in content production, targeted content and internal recognition and motivation initiatives can generate (improving employee engagement). Initially, the A route may be for many corporates the first step with the B route coming later if at all. Initially this involves moving from a corporate identity to one that has a clear brand identity and brand personality. Aligning brand to market and customers is the priority to create a human connection using a clear tone of voice and persona. Benefits to C are a dramatic increase in customer focus and a more engagement however this needs investment and commitment to work. Moving from to path C involves reassessing brand communications across the board – e.g. a great blog may jar with a corporate newsletter that is then starchy and echoes of the older brand style. A transition from along path B will be a difficult step. CEO’s are often faced with the dilemma of changing and leading change. Ford took the move of hiring Scott Monty to develop and lead their social media strategy. Whilst this may jar against a more corporate culture it can dramatically demonstrate a commitment to change, investment in social media and accelerate the transition. Much though depends on the starting point of the culture and leadership.